In this day and age where cyber terrorism and hacking has become a serious threat, it is no longer safe to just throw old computers into the waste bins. Doing such could put important data like banking records, company information and even private correspondence at risk. It is best to always seek professional help in hard drive shredding. Torrance E-Waste Recycling is the best solution for your needs. Using All Green Electronics Recycling technology, we make sure that we do hard drive shredding right. When left with nothing to worry, businesses and individuals can now focus on other more important concerns. 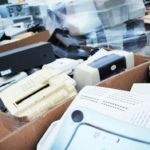 All Green Electronics Recycling is making two options available under its Torrance E-Waste Recycling services. Customers who are very protective of their hard drive’s data content can opt for hard drive destruction services in their homes. An option is to call our IT professionals and ask for a pickup of hard drives for destruction in our designated plant. We use only custom built mobile shredders and a data security system that are the best in the world. Our Untha RS-30 shredder can reduce your hard drives into very fine pieces of about 8 mm in diameter in less than an hour. All Green Electronics Recycling challenged California schools to collect one million pounds of e-waste for America Recycles Day—and 186th Street Elementary was one of the schools that stepped up and accepted the challenge.